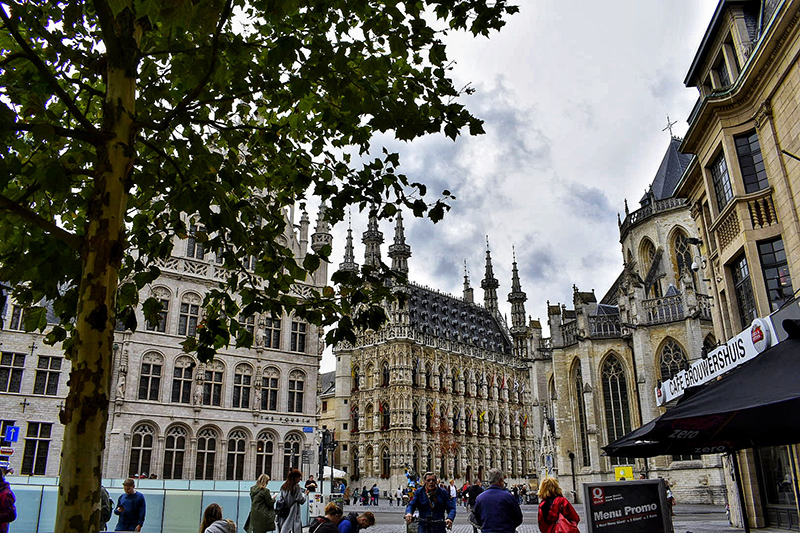 Home Cities Daytrips Guide to Leuven – A Weekend Trip to Belgium! Have you already been all over the Netherlands? 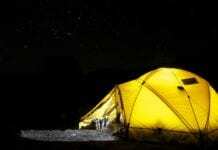 Are you looking for some new weekend trip ideas? Then a quick trip to Belgium might but just what you needed. 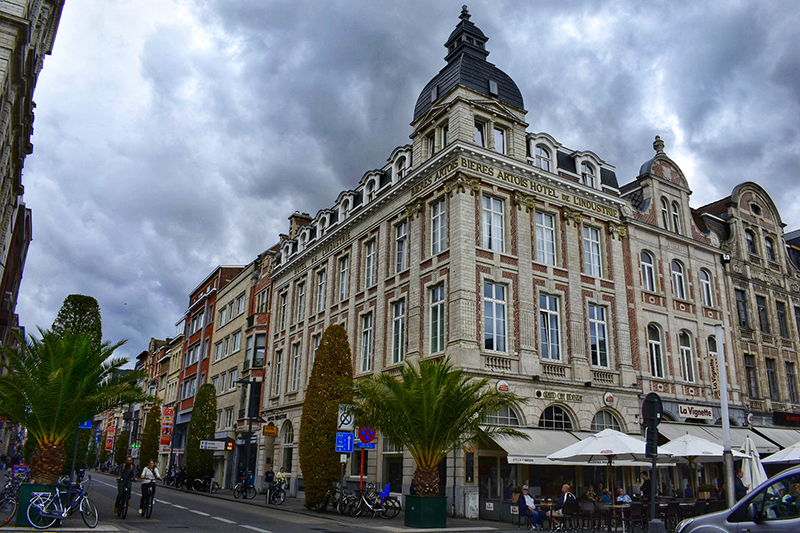 Here is our guide to Leuven – one of Belgium’s most charming cities. Just like any other European historical city, Leuven has a vast and complex history that cannot be told in one paragraph. Such an attempt would be sad and utterly disrespectful. 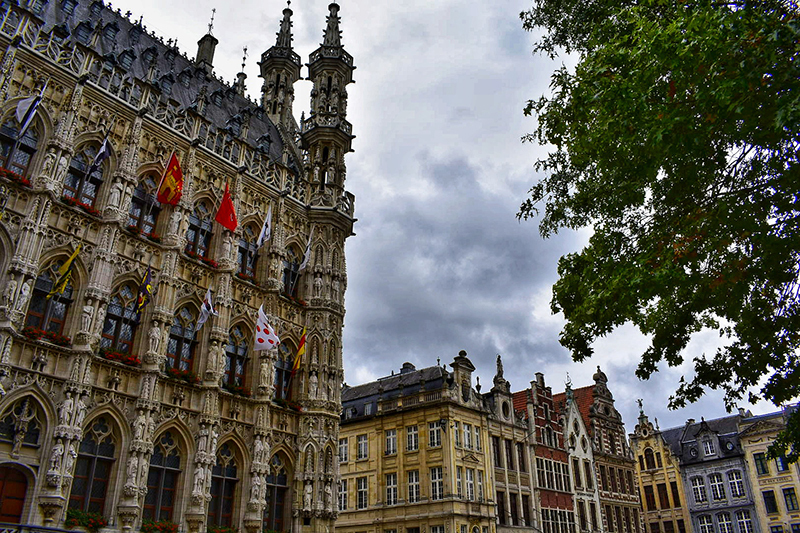 But here are just a few facts about Leuven that can give you a glimpse of this magnificent city is all about. 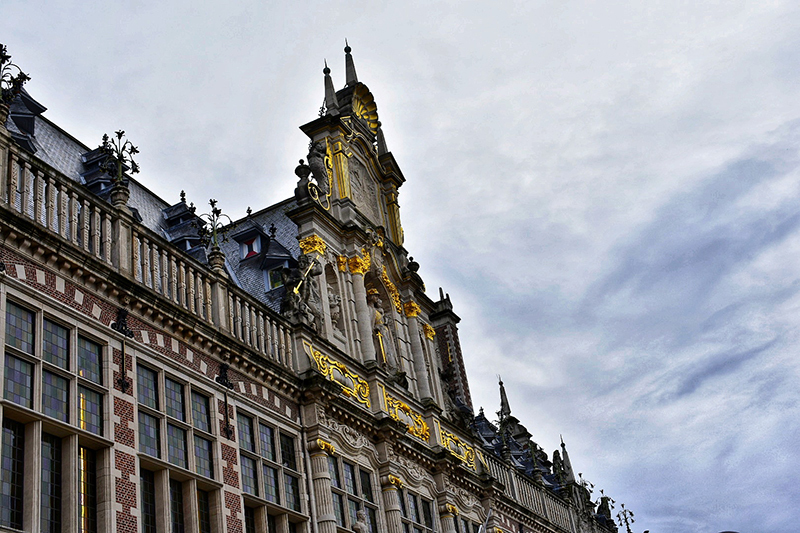 Leuven is the capital of the province of Flemish Brabant in Belgium. 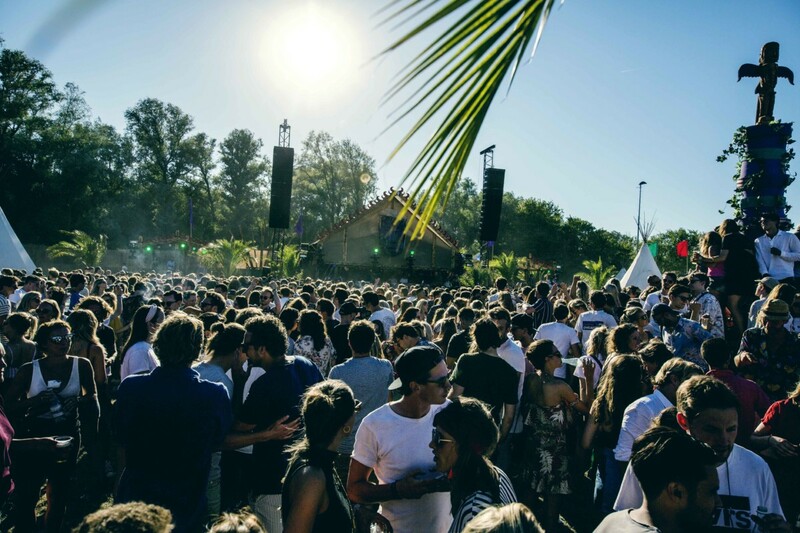 It is located very close to Brussels (25 kilometers to be precise), which makes the city feel like a sort of haven away from the hustle and bustle of the capital. 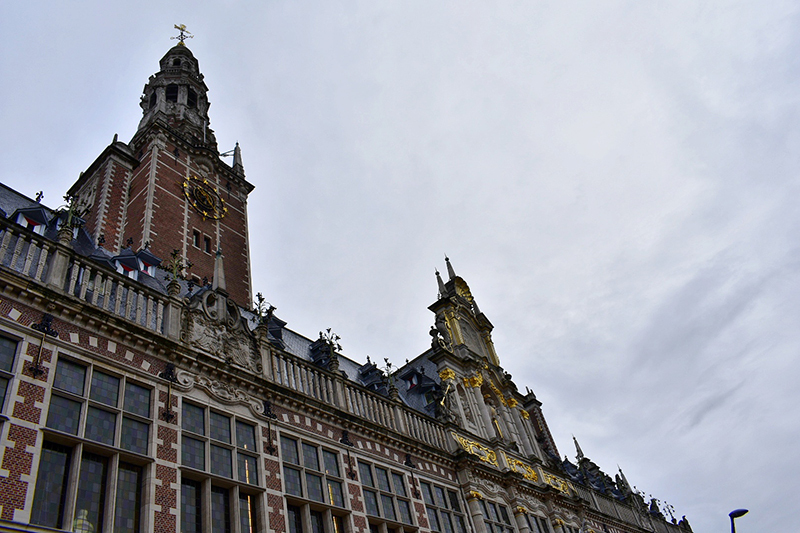 The earliest mention of Leuven dates back to 891 (yes, we are not missing any numbers!). In the 20th century, both world wars inflicted major damage upon the city. 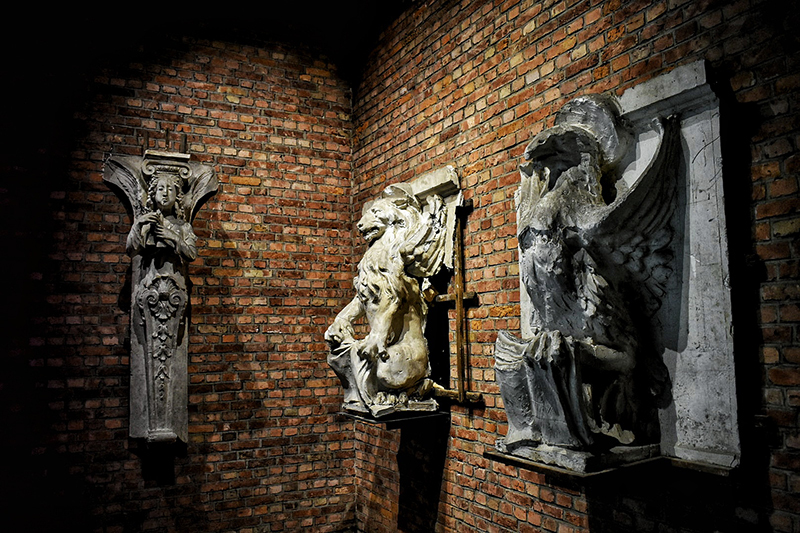 So just like any other city that has been around for centuries, Leuven also carries with it a strong feeling of historical resilience and awe. One of the best things about Leuven is that it carries a small town charm. 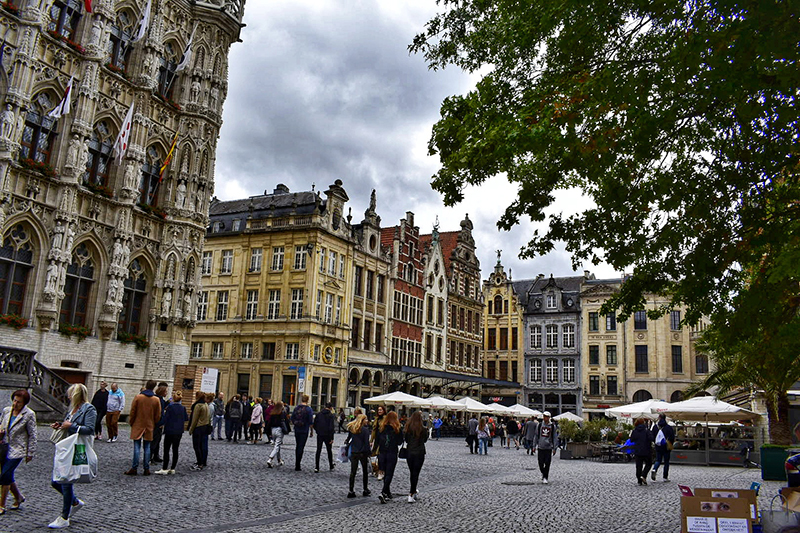 All the monuments, historical buildings, attractive restaurants, cafes and shops are situated within Leuven’s city center. You have a few big squares, and a lot of narrow streets that simply look magical. This especially comes in handy when the weather is not so great and it’s pouring rain all the time (been there, done that). So you literally have all of the city’s highlights in one place. Oh, and we strongly recommend a stroll through the city center at night. 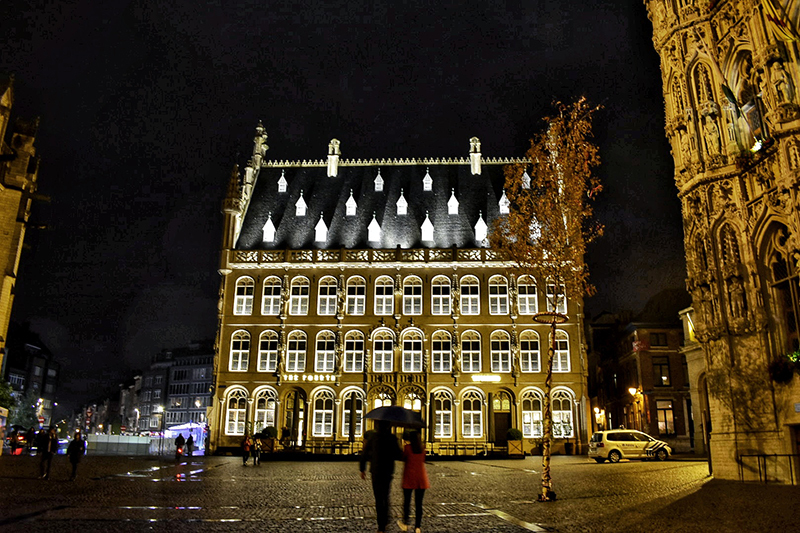 All the historical buildings, restaurants and their lights turn Leuven into a surprisingly romantic place. 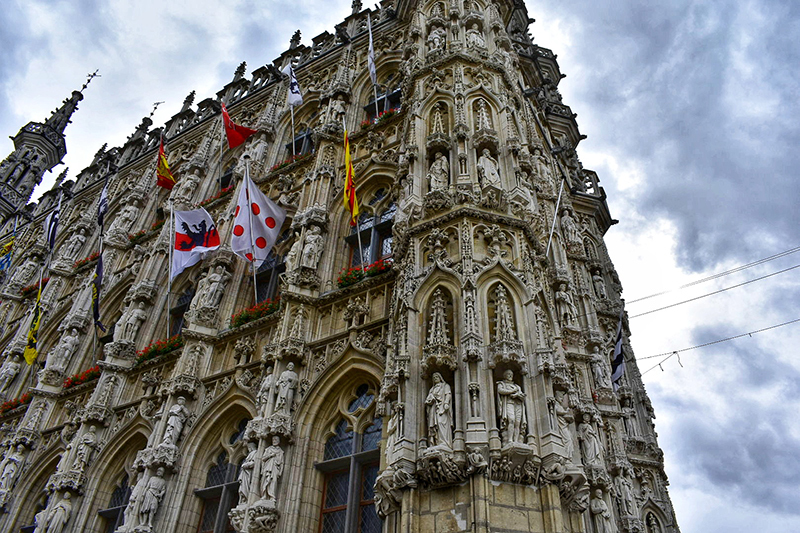 One of the first things that will grab your attention when walking through the streets of Leuven is the town hall. It’s really hard to miss as well! Frankly speaking, this has to be one of the most magnificent buildings I have seen in my entire life. And it comes to no surprise that it is one of the best-known Gothic town halls in the world. Not only is it massive in size, but the detail of its exterior is mind blowing. Once you take a closer look, you notice all the 236 statues of different people that are significant to the history of Leuven. On the first floor are personages of importance in the local history of the city. 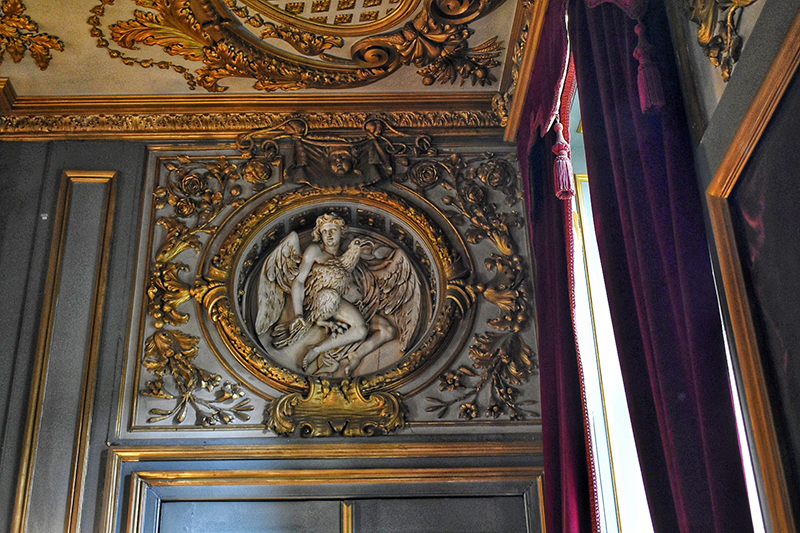 On the second floor are patron saints and symbolic figures. 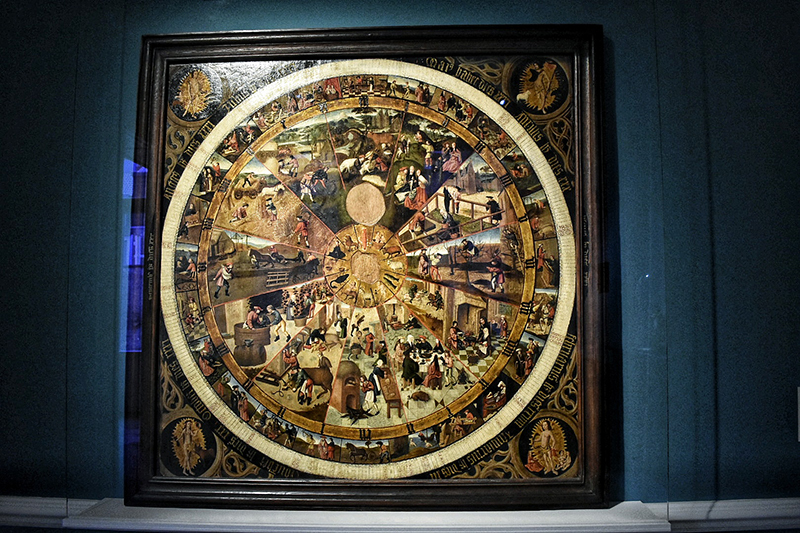 And on the third floor are the Counts of Leuven and Dukes of Brabant from various ages. 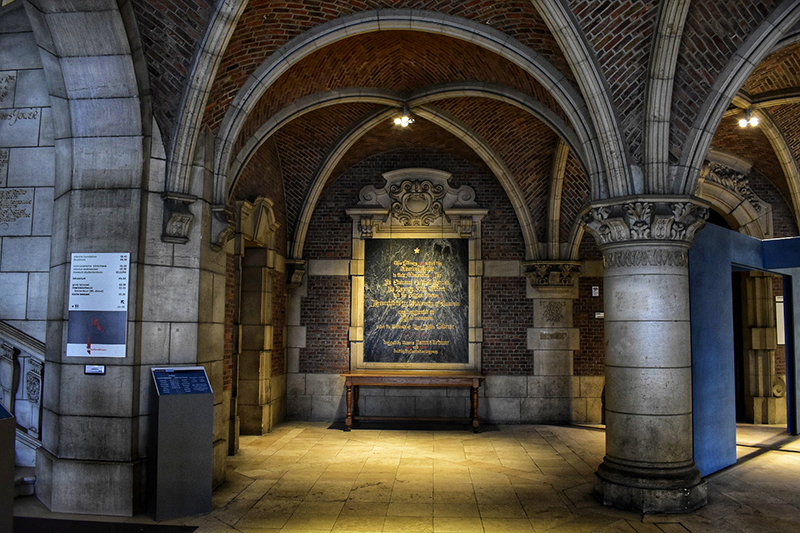 You can also go inside Leuven’s town hall via guided tours (in Dutch or English). 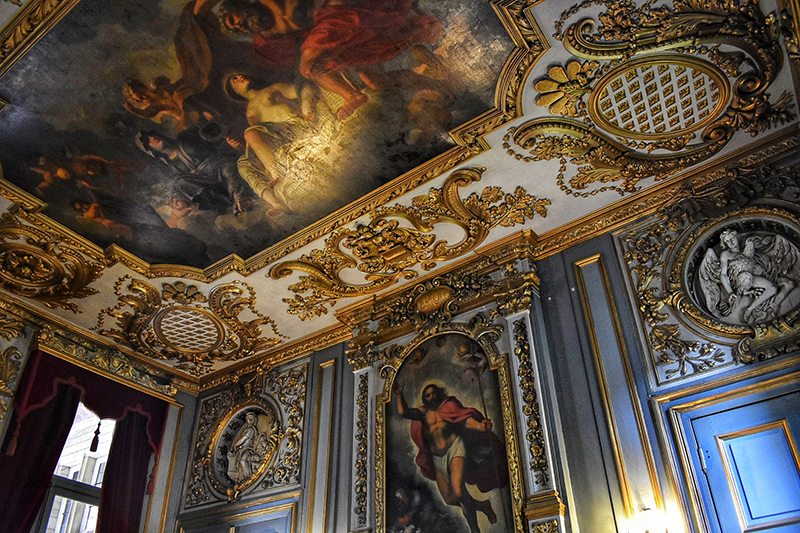 This way you can actually explore the town hall’s lavish rooms and admire the exquisite interior. Inside you’ll find a collection of artwork, sculptures, portraits of Leuven’s mayors since 1794, as well as the current mayor’s office. Visiting the University Library in Leuven pretty much felt like stepping into a Harry Potter movie. Yes, it was that amazing! 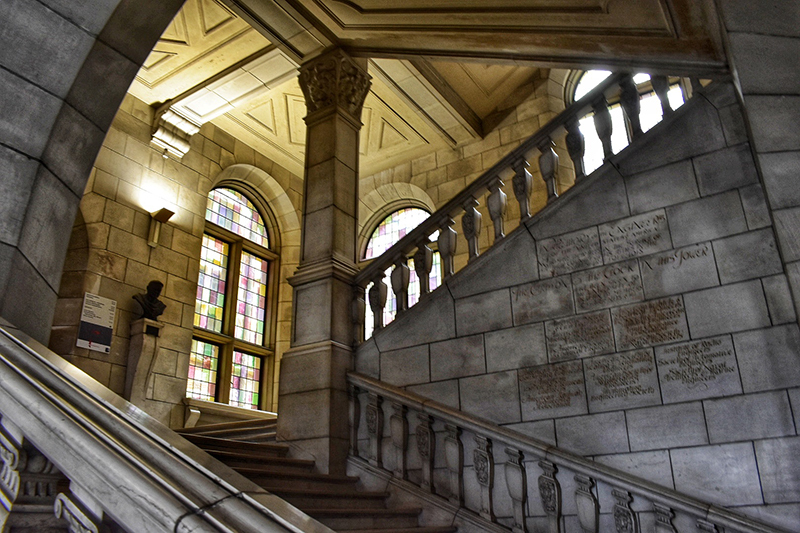 The exterior of the library is quite impressive, but the real beauty is hidden inside the building. 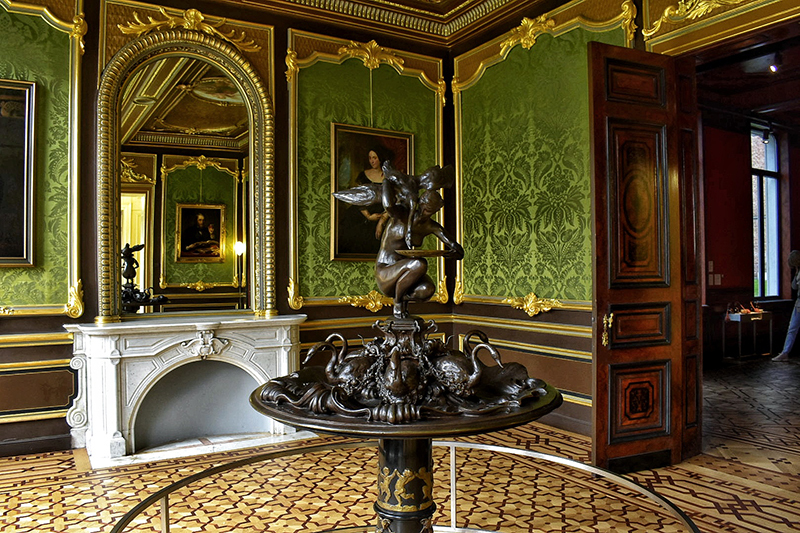 Upon entering, you are left in awe from the marvel carvings and staircases decorated with lavish details. The halls are spacious, and you can see on display a variety of paintings, statues, and antiquities. 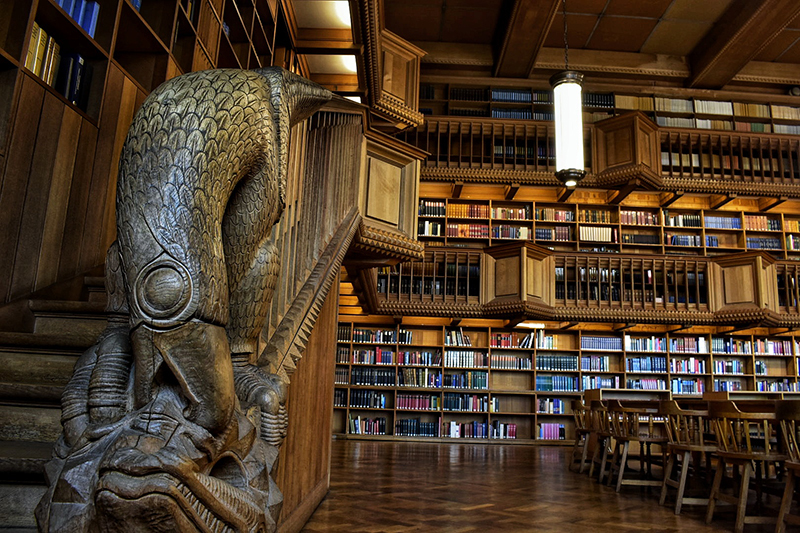 However, the real “Harry Potter moment” hits you when you enter the wonderful reading room. Everything is made out of wood, and I do mean everything! And all of this goodness is spread across two floors. On the shelves you can find all kinds of books. Some are brand new and explore more modern concepts. Others are so old, that it looks like they might fall apart if you try opening them. 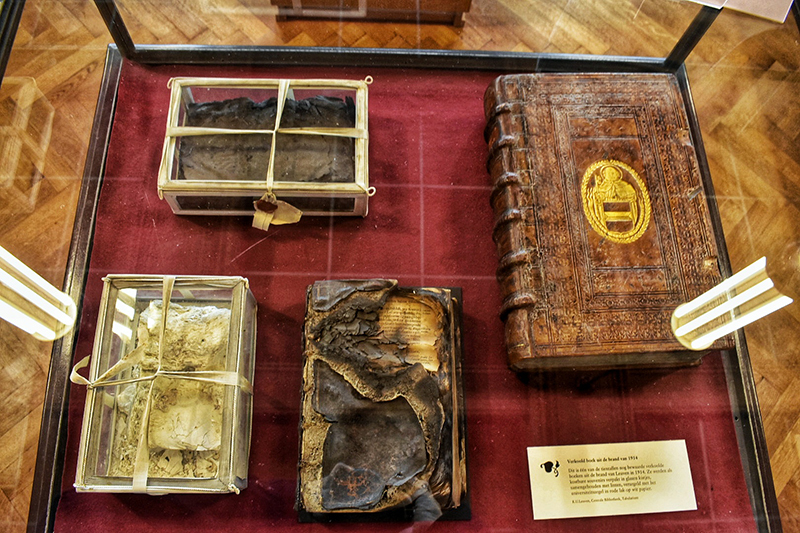 Not to mention the books that are so old, that they had to be singled out and put on display because it is that impressive to see a book so ancient. 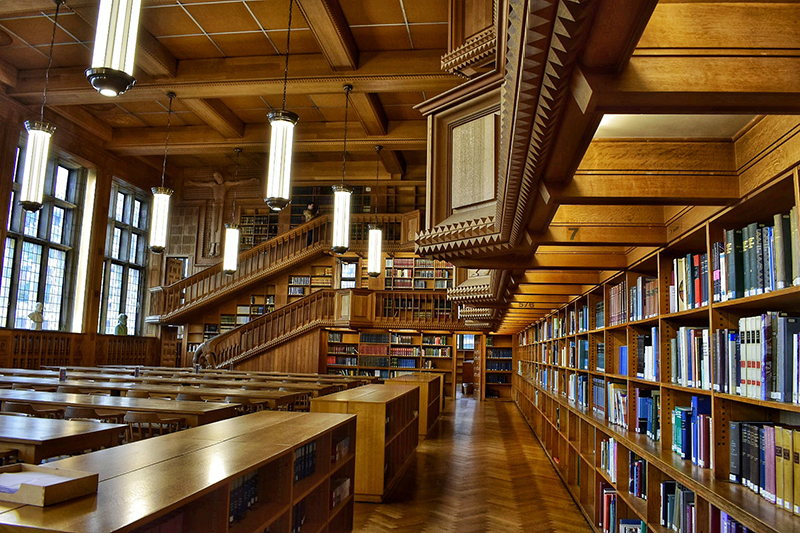 But the University Library in Leuven has a lot more to offer than that. Yes, a lot more! The building has a clock tower which is actually open to visitors via a very narrow staircase. 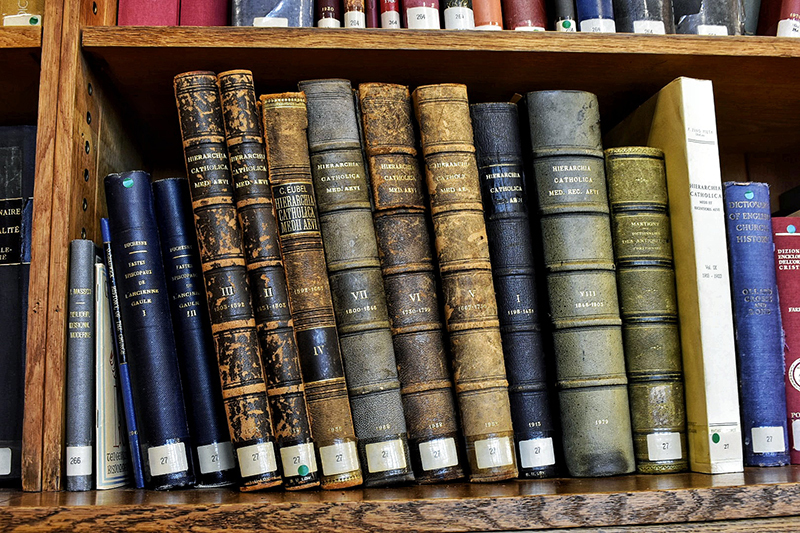 While climbing the five floors of the library tower, you also get to learn about the library’s turbulent history. 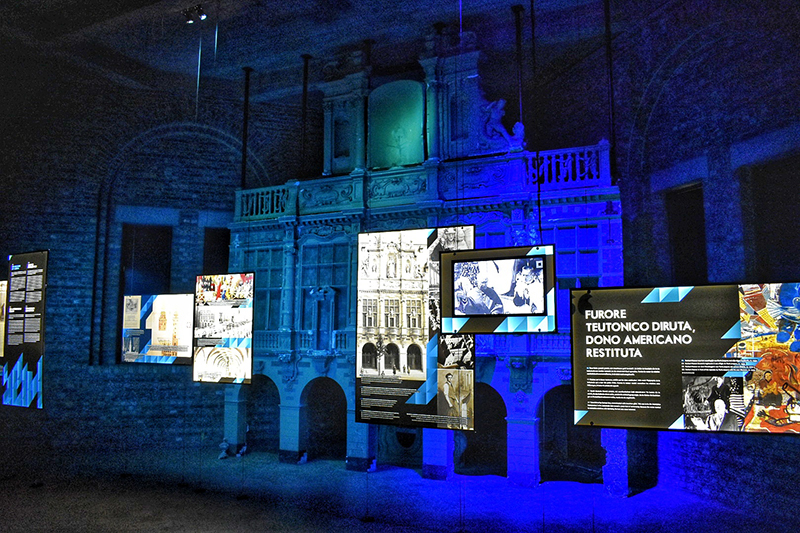 With each new level, a photo exhibition takes you to five significant periods in the library’s history, especially its destruction during the first World War. 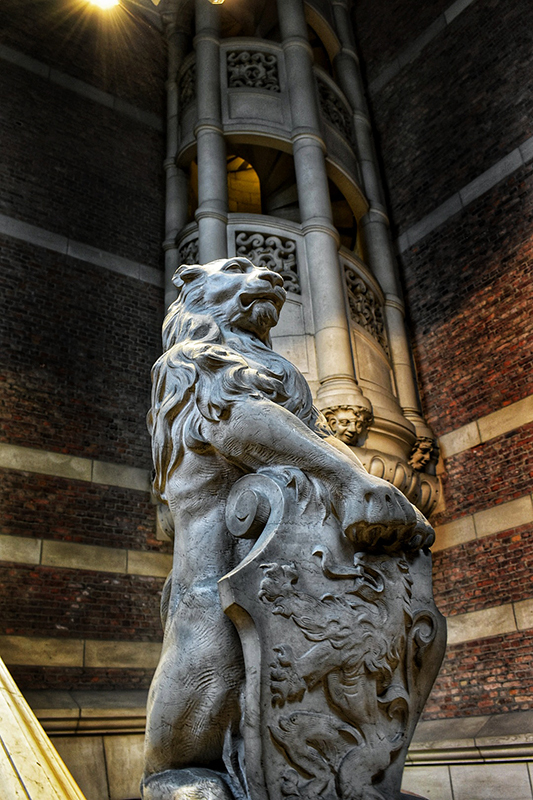 Once you reach the top of the tower, a breathtaking view of Leuven opens before you. It’s the gift that keeps on giving! You can walk around the tower’s terrace and look down upon different parts of the city. Unfortunately, on the day that we were there, it was extremely rainy and cloudy. However, the view was still pretty impressive. Just see for yourself! While visiting Leuven you should also go through the M-Museum. 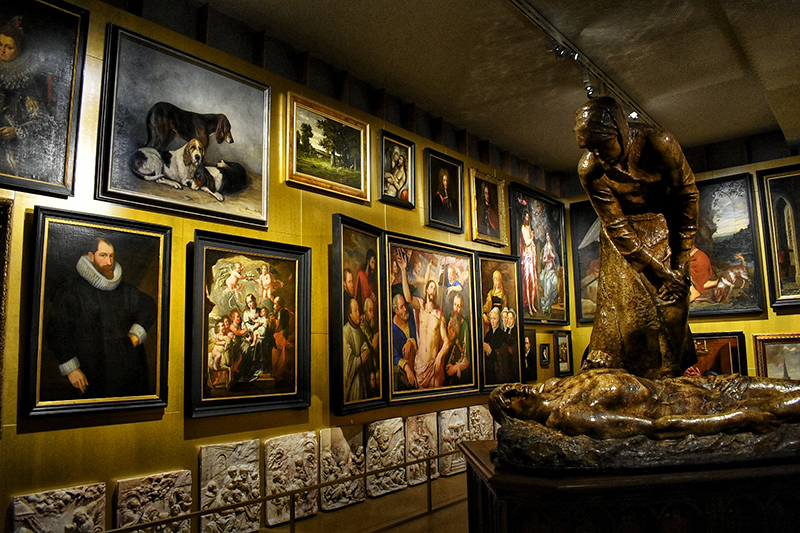 What makes this particular museum unique in Flanders, is the combination of contemporary and classic art. 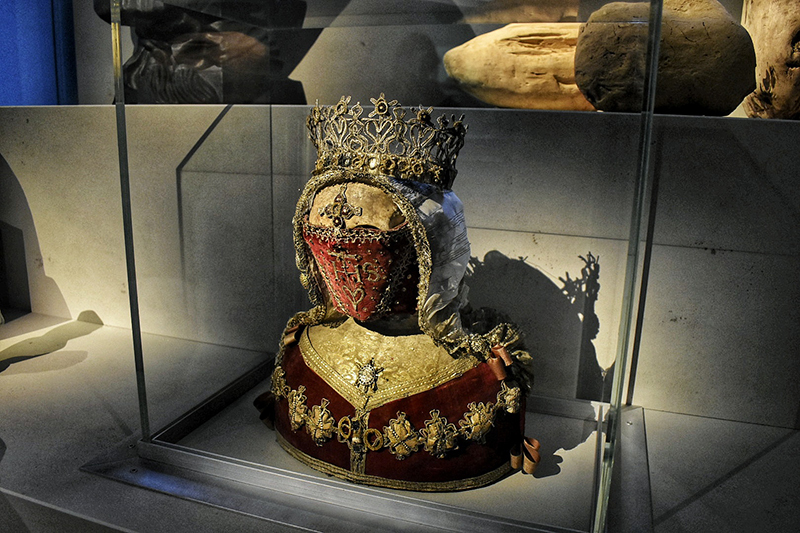 There are more than 52,500 objects on display at the M-Museum. 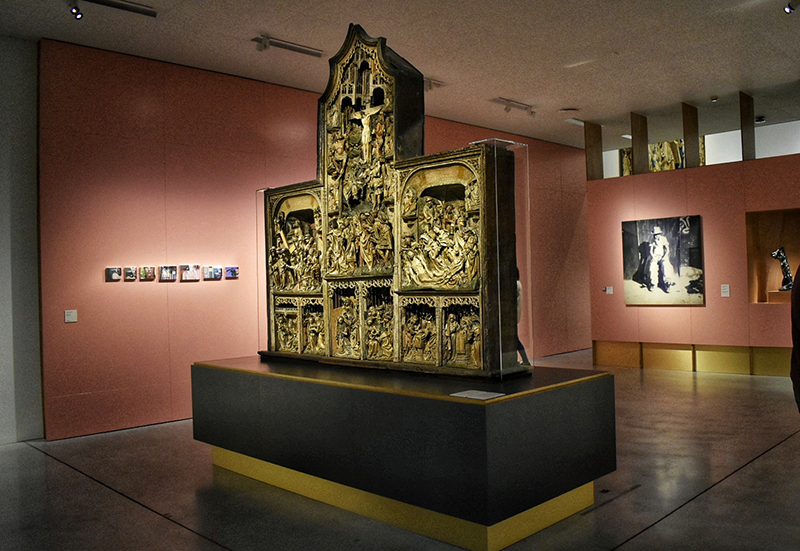 Collections vary from artistic production in Leuven and Brabant from the Middle Ages to the 20th century. There is also a significant focus on post-1945 Belgian art. The museum is not overly packed like most museums in Amsterdam, so you genuinely get to enjoy and observe the exhibitions. They are all separated into different rooms that carry the theme of the objects themselves. I would also strongly recommend you get the audio tour, because the stories about some of the art pieces are simply fascinating. My favorite one was about the meaning behind the Calendar Dial exposition. So make sure to listen in on that story whenever you visit the museum. 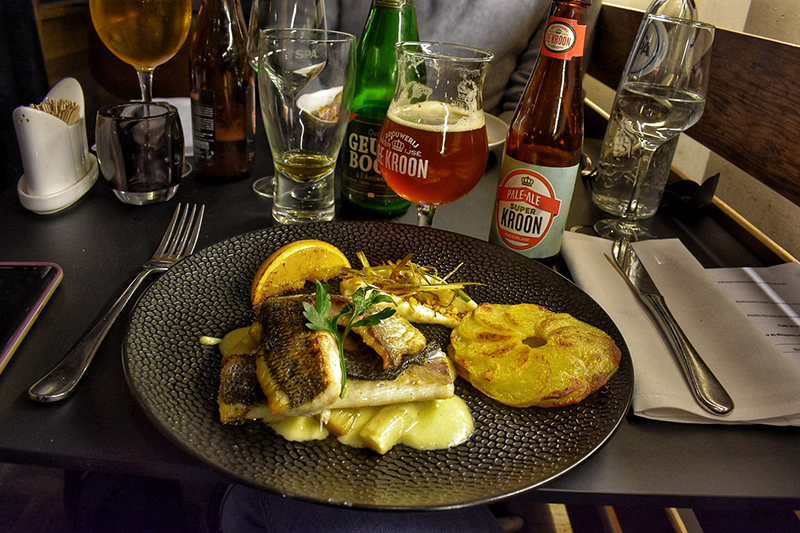 Since we were in Belgium, we opted for a proper dinner with a variety of Belgian beer. That is why our restaurant of choice was Kokoon. 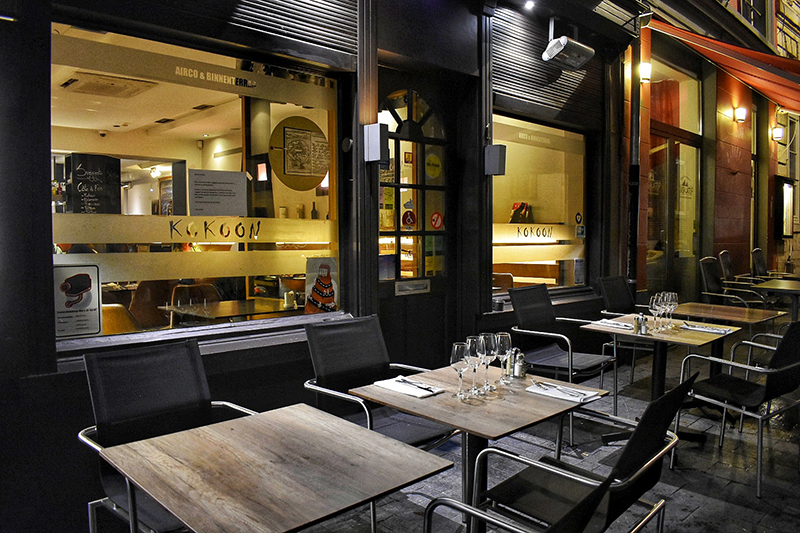 Hidden within the romantic narrow streets of Leuven, Kokoon offers you a unique dining experience with a variety of beers. Or as we decided to call it, a “beer parade”. 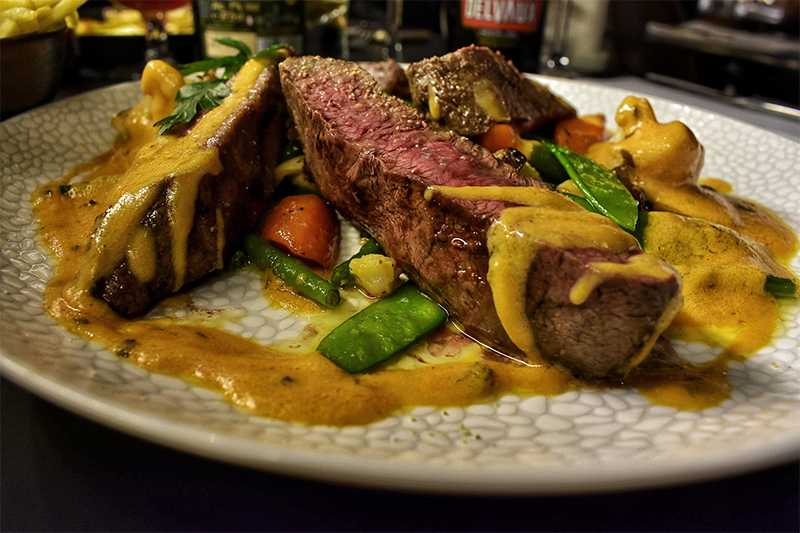 We went for the “Kokoon Menu” which allows you to order a starter, main dish, and desert all while the waiter brings you Belgian beers that go well with the food your choice. 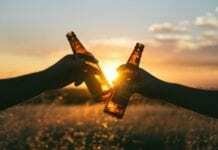 You also get to learn a lot about the beers that you are drinking and why they compliment the dish that you have ordered. 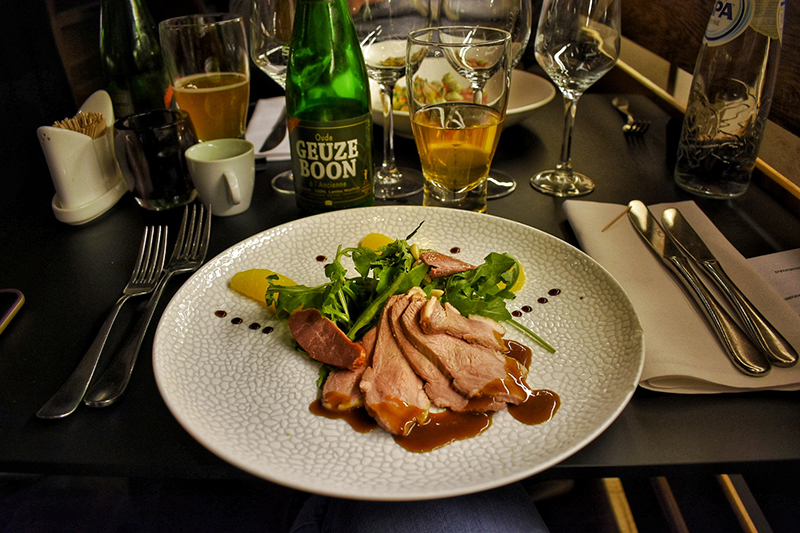 The best way to describe that dining experience is high class dining with beer tastings. It is only normal to want to shop during your weekend trip to a foreign country. And Leuven has made that awfully easy for its visitors. You can find all the stores you need along the streets leading to the city square. 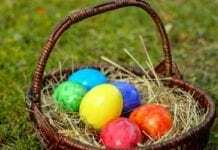 Clothing, food, souvenirs – you name it! The streets are also sprinkled with small cafes here and there, so you can always sit down for a quick refreshment. Since we went there during the weekend (hence, weekend trip) we also got the chance to explore a small outdoor market that was spread throughout the shopping street. The street vendors were very hospitable, letting us try various fruits, cheeses, meets, and many other natural foods (because that’s trendy now). During our weekend trip to Leuven we stayed at the Park Inn hotel, which situated in the most perfect spot! You are right next to the Leuven Central train station, and one bridge away from Leuven’s city center. The best part of our stay there was the view that we got from our hotel room on the 6th floor. 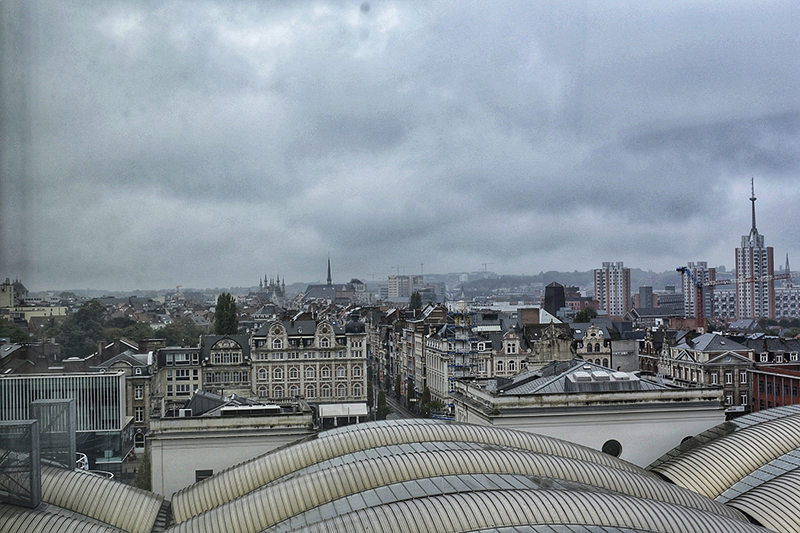 Every morning we would pull the curtains and see all of Leuven just from our bedroom window. 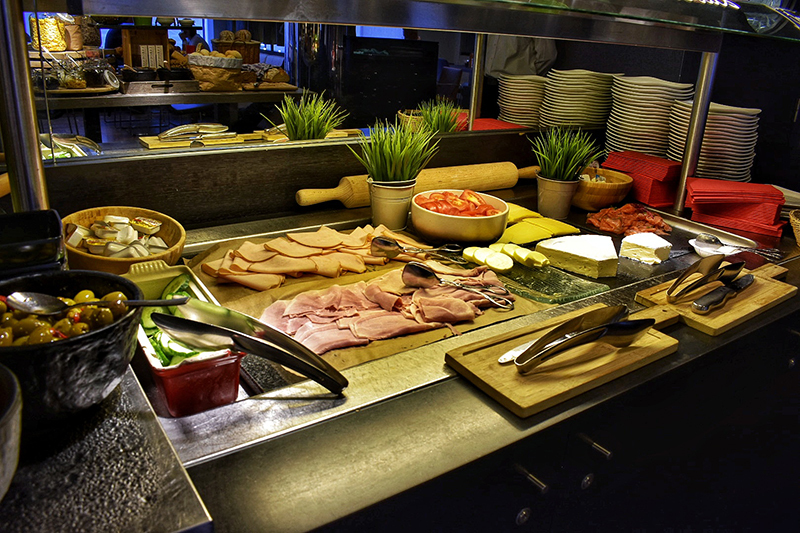 Another amazing thing about staying at the Park Inn hotel in Leuven was the breakfast buffet. 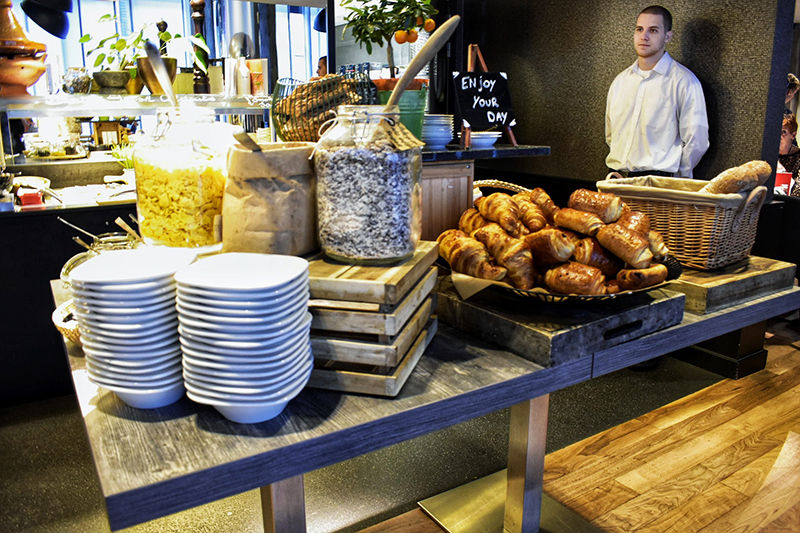 There are people who prefer a savory breakfast, there are people who prefer a sugary breakfast, and then there was us – eating a little bit of everything because the food was that delicious! 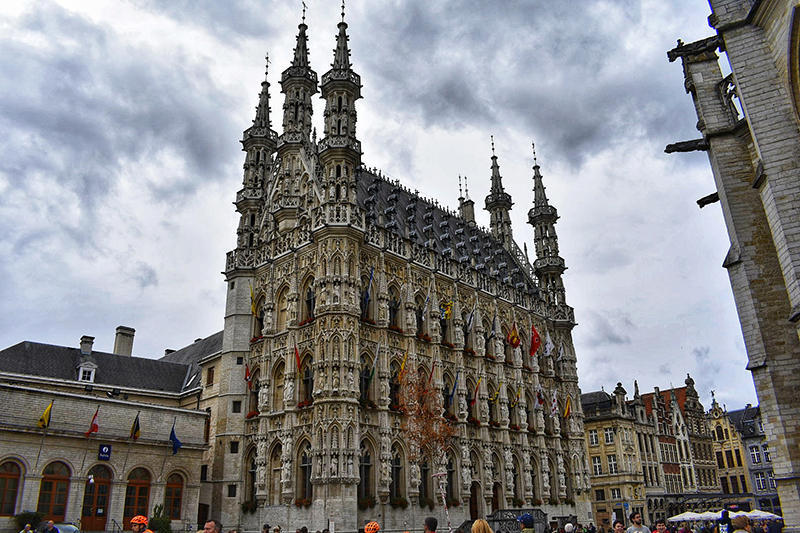 Guide to Leuven: How do I get from the Netherlands to Leuven? It is very easy to get from the Netherlands to Belgium thanks to this little thing called NS International, as well as the European Union (please don’t fall apart!). All jokes (and fears) aside, getting from The Hague to Leuven was a piece of cake. Just in two and a half hours we were in a different country enjoying the splendors of living in such a geographically convenient location. 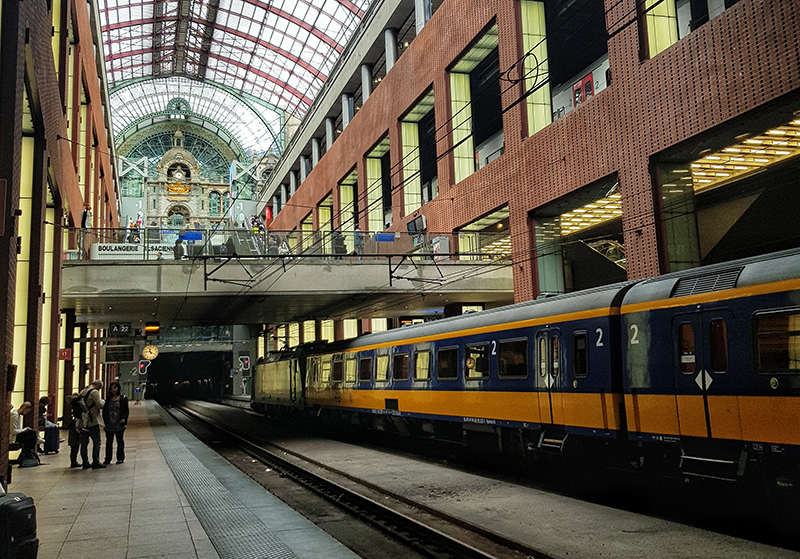 So if you’re planning a weekend trip to Leuven, you should definitely buy your tickets ahead of time through NS International, and it’s nothing but smooth sailing (riding?) from then on. So this wraps up our guide to Leuven! Have you ever been there? 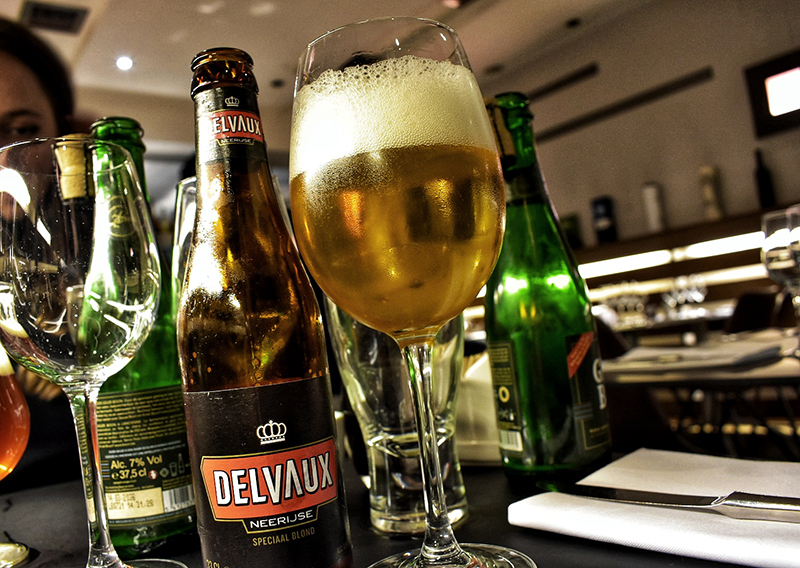 Are you planning on going on a weekend trip to Leuven any time soon? Let us know in the comments below! 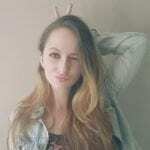 Previous articleInternational students: why does everyone want to study in the Netherlands?